Are your Boom Operators busy on site and often forget to capture key job information, meaning you can’t complete docketing and get the invoice out on time? Does this cost you hours of effort that could be channeled to more important things? 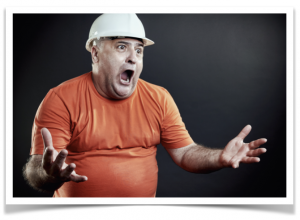 Its hard to put pressure on your Operators as they have lots to juggle on site but on the other hand you need the information. It takes a lot of effort to chase the team for information on a job that may have been hours or days ago. Accuracy becomes an issue and may put you at risk of not invoicing the customer for the job correctly which could also cost you margin or worse overcharging the customer. A simple and easy way to manage this is to give the Operator a checklist that clearly outlines the key information you want captured from the job site. This is not another docket to complete but a simple checklist that can be referenced (A5 size and laminated left in the truck) that they can glance at to ensure all the key information is captured on the docket before they leave the site. Using a checklist with software that allows the job data to be captured at the right time means the Operator does it once and you get to re-use that job data in reports and invoicing. Your customers will never question your invoices or timesheet reports because they have been set based on job completion milestones captured as they occurred on the job. 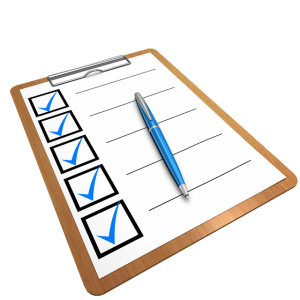 We have a free checklist you can start using, click below to download it here. 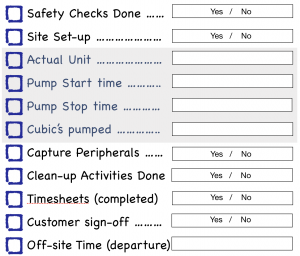 If you are interested in taking your Checklist to the next level, we incorporate mandatory job information capture and checklists within our concrete pump management software. We would love to show you how software can help your industry, request a 15 min chat here.